Do you want to get The Last Best Box or send it as a gift, but can't wait until the next month's box is shipped? Consider one of our 2019 April Boxes! 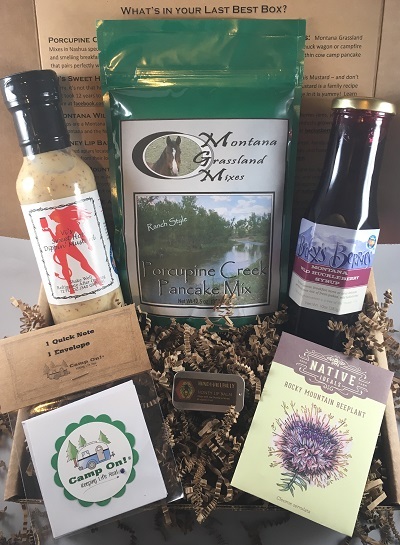 It includes Porcupine Creek Pancake Mix from Montana Grassland Mixes (Nashua), Vi’s Sweet Hot Dippin’ Mustard from Vi’s Mustard (Dell), Montana Wild Huckleberry Syrup from Becky’s Berries (Absarokee), Honey Lip Balm from Hindu Hillbilly (Clark Fork Valley), Rocky Mountain Beeplant Seed Packet from Native Ideals (Arlee), and Quick Note and Envelope from Camp On! (Helena). This box is separate from the monthly subscription, and can be shipped anytime. We use USPS 1-3 priority mail, and generally ship your box 1-3 days after you place your order. Contact us if you have any special instructions or questions. Cheers!